!!! ATTENTION !!! This is highly experimental and relies on experimental features of the simulator. Behavior may be unpredictable if used incorrectly. Size of this type is 752 bytes (on a 64-bit architecture). Definition at line 39 of file ndn-consumer-window.hpp. Definition at line 60 of file ndn-consumer-window.hpp. Definition at line 85 of file ndn-consumer-window.cpp. Definition at line 38 of file ndn-consumer-window.cpp. References m_inFlight, m_setInitialWindowOnTimeout, and m_window. Definition at line 185 of file ndn-consumer-window.cpp. References m_inFlight, m_window, ns3::ndn::Consumer::OnData(), and ScheduleNextPacket(). Definition at line 199 of file ndn-consumer-window.cpp. References m_inFlight, m_initialWindow, m_setInitialWindowOnTimeout, m_window, and ns3::ndn::Consumer::OnTimeout(). Definition at line 214 of file ndn-consumer-window.cpp. Definition at line 155 of file ndn-consumer-window.cpp. 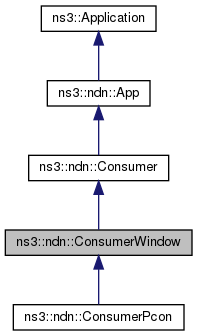 References m_inFlight, ns3::ndn::Consumer::m_rtt, ns3::ndn::Consumer::m_sendEvent, m_window, and ns3::ndn::Consumer::SendPacket(). Referenced by OnData(), and ns3::ndn::ConsumerPcon::OnData(). Definition at line 96 of file ndn-consumer-window.hpp. Definition at line 97 of file ndn-consumer-window.hpp. Definition at line 99 of file ndn-consumer-window.hpp. Definition at line 100 of file ndn-consumer-window.hpp. Referenced by GetTypeId(), and OnTimeout(). Definition at line 102 of file ndn-consumer-window.hpp. Referenced by GetTypeId(), OnData(), ns3::ndn::ConsumerPcon::OnData(), OnTimeout(), ns3::ndn::ConsumerPcon::OnTimeout(), and ScheduleNextPacket(). Definition at line 103 of file ndn-consumer-window.hpp. Referenced by GetTypeId(), OnData(), ns3::ndn::ConsumerPcon::OnData(), OnTimeout(), ns3::ndn::ConsumerPcon::OnTimeout(), ScheduleNextPacket(), and WillSendOutInterest().